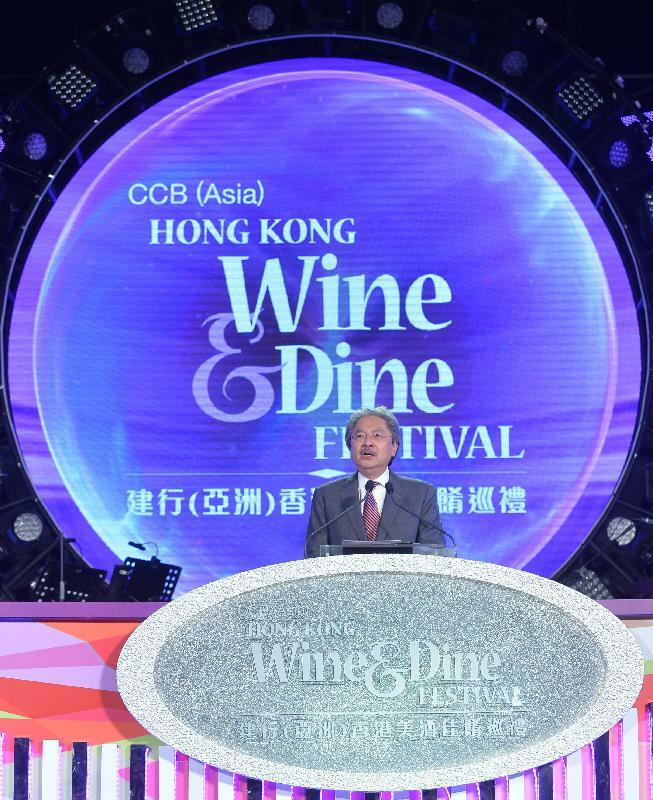 And welcome, one and all, to this year's Hong Kong Wine & Dine Festival. I ask you, can there be two nouns in the English language more inviting, more enticing, than "wine" and "dine"? Think about that. "Bacon" and "eggs"? No. "Pork" and "beans"? I don't think so. "Fish" and "chips"? Only if you're English. Now add the magic word "festival", and we have got four dazzling days and nights of fabulous fun, here by the magnificent Victoria Harbour of our glittering city. 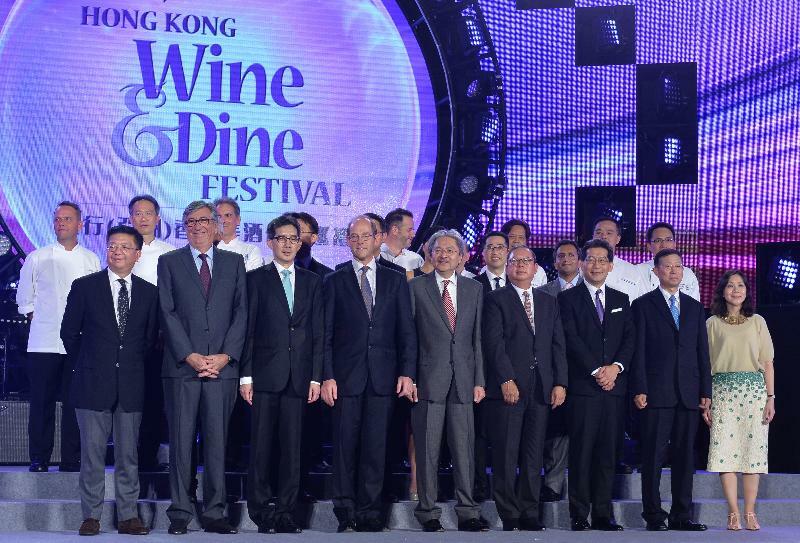 And this, by the way, is the eighth Hong Kong Wine & Dine Festival. And it was brought to red, white and rosy life in 2009, one year after we decided to do away with the wine duty and make Hong Kong a wine free-port. 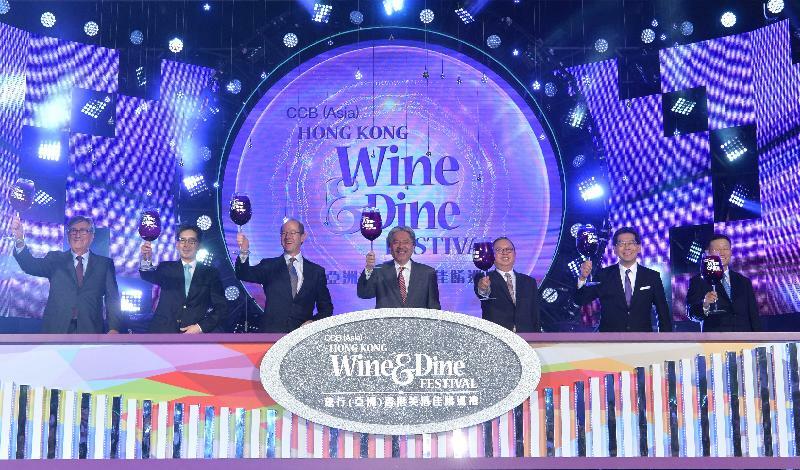 In the years since, Hong Kong has emerged as the region's wine-trading hub, while Hong Kong people have cultivated a spirited taste for the grape. Last year, Hong Kong took in a record $10.8 billion worth of wine from around the world, and that is 2.8 times more than what we imported in 2008. And our fascination with wine is all-consuming, from international commerce to big-bottle auctions as well as secure storage. As for the dining part of this festival, Hong Kong has long been hailed as the true paradise for foodies. We've got just about everything, from Hong Kong-style yum cha and street food, to Michelin-starred restaurants serving international cuisines from every corner of the earth. Anything an adventurous epicurean could dream of. And the Hong Kong food scene is revving up for even more. By year's end, the Hong Kong Government will put its Food Truck Pilot Scheme on the road, starting with a caravan of 16 at eight tourist attractions. I can't wait to join the line. This year, the good-life prospects are all but endless. With 20 per cent more space to play with, the Festival welcomes 20 per cent more booths - 280 for fine wine, 140 for fab food. Together, they fill five soon-to-be-packed theme zones. And most of it is there for you in the beguiling alfresco setting. Alongside the wine booths from nine countries and regions, there's a world of rare whisky and award-winning craft beer to toast to. And the Hong Kong Bar showcases magnificent mixology, while Street Eat features the best of Hong Kong street food. For this, for the Hong Kong Wine & Dine Festival, my thanks go out to our innovative organiser, Peter and the Hong Kong Tourism Board. And beyond the festival, the good folks at the Tourism Board have put together a whole month's worth of epicurean events. They call it the Hong Kong Great November Feast. Highlights will include best-value wine-pairing menus at Michelin-starred restaurants, together with wine walks and street carnivals. In my experience, wine walks generally turn into street carnivals. But that's another story. But ladies and gentlemen, now let's raise a generous glass to this fantastic festival. So cheers and bon appétit!